Summer will be coming as soon as you know it and that means vacation time! Of course, your pet needs a vacation too! For the next couple of weeks, Itchmo will be highlighting some dog-friendly places that you and your furry friend can travel to. Chicago, IL is voted as one of the most dog-friendly places to visit. 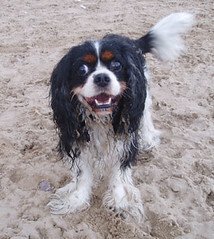 There are 10 off-leash dog parks, an indoor dog park named Of Mutts and Men, and a couple of off-leash dog beaches. Stay at the Hotel Monaco where your pet will be pampered as much as you are (they are given a bed, bowl and treat at check-in and get their picture taken). Take your dog on a tour of the great Chicago architecture on a Canine Cruise or take your dog for a carriage ride through the city. Take a break from all of the excitement and eat outside at many of the restaurants that have outdoor, dog-friendly seating areas. Your dog just won’t want to leave. This entry was posted on Monday, April 30th, 2007 at 4:02 am	and is filed under Dogs, Cats, Chicago, Products & Services for Cats & Dogs, Misc. Pet Info., Dog Parks & Travel. You can follow any responses to this entry through the RSS 2.0 feed. Both comments and pings are currently closed.